You’ll probably agree, that if you’re looking for wedding rings for men, and you don’t know all that much about jewelry, it may be hard to find the information you need all in one place. Consider the issue of all the various styles. A man’s wedding ring may be the only piece of jewelry he wears. Should it be a classic and simple wedding band for men that his father and grandfather wore, something with a more modern design—even venturing into something with some panache? Style, metal choices, width, durability, and the cost of the ring are all important factors. Also, these days, with conflict metals, ethics (especially Fairtrade Gold) should also be a basic consideration. You’ll get the basics and the real story, and the information you can use right now in order to make an informed purchase. Best of all, you’ll learn key facts about wedding rings for men that few other jewelers would reveal. This two tone Donegal Wedding Ring is a great display of a designer take on the classic/more traditional mens wedding band. 1. What Makes A Mens Wedding Ring A Mens Wedding Ring? The simple answer to this question is: if you are a man and you like the ring, then it is a man's wedding ring. The consideration men often have is, is the ring too feminine or not masculine enough? This is totally a personal preference. For example, while some men might consider this two tone wedding ring too feminine, we’ve sold this design to men over and over again. Yet, jewelers do break out collections of wedding rings, designating some as mens rings and some as women’s rings. In the case of gender, the sort is usually based upon two criteria: width and style. Mens wedding bands are most often wider than wedding rings for women. Since men generally have larger hands, proportionally men want larger rings. 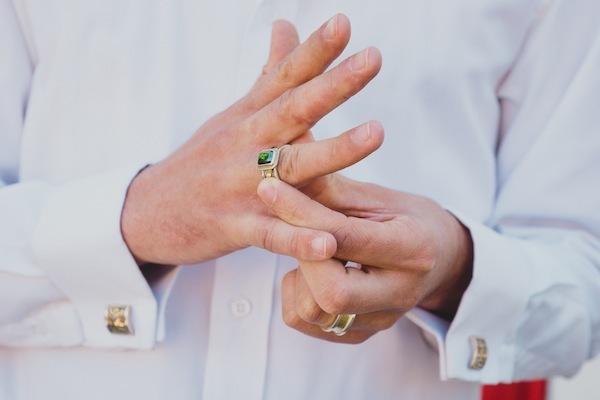 Mens wedding rings tend to be heavier, wider, and sometimes even"chunkier." A mens wedding band generally ranges from 5mm to 8mm wide. Typically, men do not choose under 5mm for their wedding rings, with perhaps the exception of classic comfort fit wedding bands. Men usually do not go much over 8mm width even if they have large hands. This parameter is not iron clad of course, but rather based upon what I’ve noticed selling rings to men over the past twenty-plus years. These mens engagement rings are handmade in our studio in Santa Fe, New Mexico. With gender equality, both men and women are proposing to men—and why not? Engagement is an important cultural tradition and an essential bridge to the lifelong commitment of marriage. Mens engagement rings are a beautiful reminder of a man’s commitment that he can show and celebrate with his greater community. One survey revealed that 71% of men would be open to wearing an engagement ring. But, if you are going to be wearing a wedding and engagement ring together, like in bridal ring sets, then consider the width, and how it will feel to wear the two rings at the same time. The most importing thing to consider in context to width is what you are most comfortable with. 3. What Are The Various Styles of Mens Wedding Rings? Wedding rings are deeply personal in what they represent. They are an outward sign of deep commitment to oneself, your partner, and your community. Also, all wedding rings have innate symbolism. Their circular shape represents wholeness, community, and unity. Style is a way in which a man can express something unique about his own individuality and partnership simultaneously. The number of different styles for mens rings is almost infinite, but we will simplify it here by breaking it down into two broad categories: classic and designer. These are all of our various takes on the classic wedding band. Simple textures can go a long way. For some, the wedding ring decision is easy: a classic wedding band. Chances are that your parents and grandparents wore one of the more traditional and simple wedding bands. The vast majority of men choose to go with this time-tested style because of its simplicity, elegance, and ageless traditional appearance. But even within this parameter, there are many, many variations. The top of a ring can be domed, or rounded off, as shown here. Or edges can be flat and straight, like here. Also, the inside of rings can be made comfort fit, which means that the interior of the ring is rounded off or curved, instead of flat. Basically, the convex metal and wider edges make the ring more comfortable to wear. Every man's wedding band holds intention as a physical representation of ceremonial commitments. And it can also, in its very design, be an object of great craftsmanship and inspiration. As for what that design may be, your imagination is the only limit, but here are just a few examples. The imagery in a mans wedding ring can be inspired by a beloved painting that represents mystery of the evening sky, such as our starry night collection. 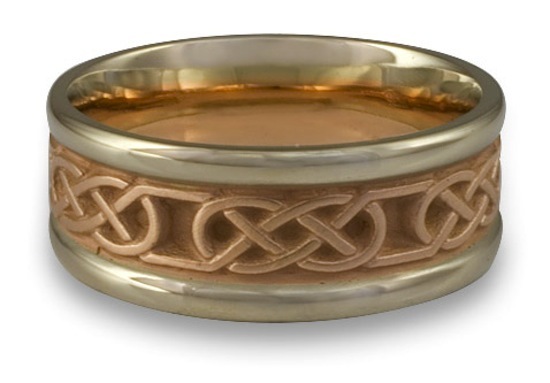 Men’s wedding rings can also reinforce and preserve spiritual, religious, or cultural connections in a variety of ways. 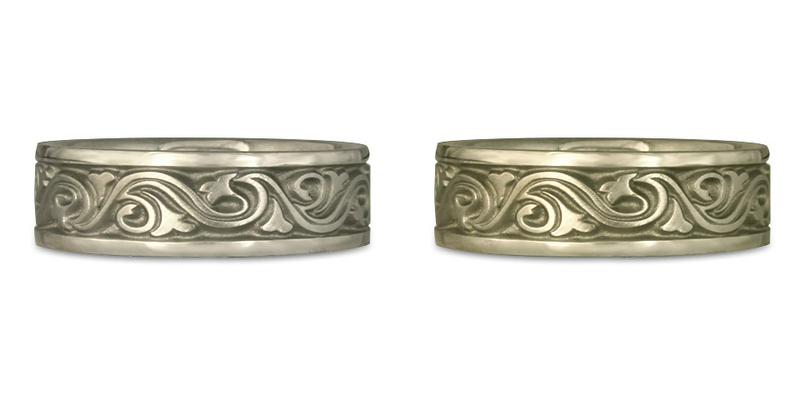 For example, in the Celtic Arches ring, each line within the motif represents a life path coming together. The strands of the knot arch up to the heavens and down to the earth, gathering energy and inspiration from both. 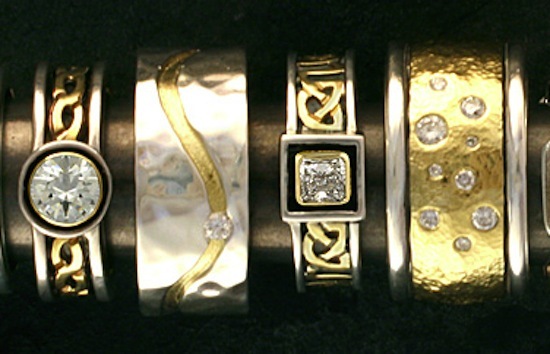 These handmade rings were custom designed by the customer and one of our jewelers working very closely together. You can also add accent gems to almost any ring to add some shine and sparkle to a design that you already love. Choosing a style in itself can be an exciting undertaking full of discovery for you and your partner. 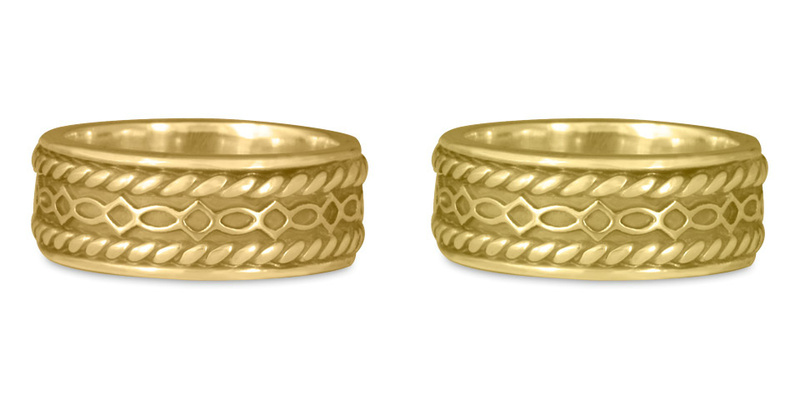 This pair of wedding rings contain the same main motif, but have varying widths and precious metal components. 6. But…What Wedding Ring Does Your Partner Want? There are no rules of matching or not matching you and your partners’ wedding bands. You don’t have to match, but many couples do prefer to. What’s fun is that you don’t have to match exactly, but you can choose to match through metal choice, style, gemstones, motif, or any other variety of ways. Many wedding rings are part of larger collections with varied widths, from narrow to wide, such as is the case of the many styles of our river ring collection or the Wind and Waves collection. Even if you do not find an exact match, many jewelers can do variations through a custom design process, which we are particularly fond of, experienced with and have lots of fun with. The particular designer wedding rings you both choose can be deeply talismanic, intimately revealing and a reminder of what is held sacred in your partnership. 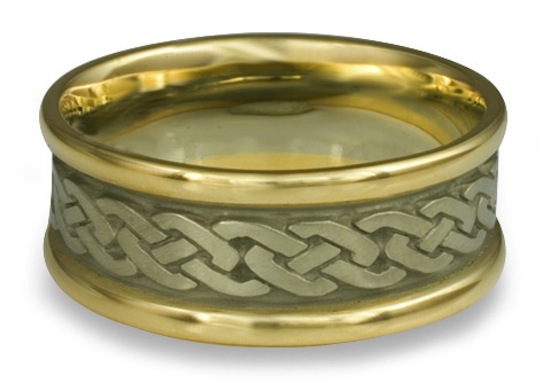 There are so many metal options for your mens wedding rings. 7. What’s The Best Metal For A Mens Wedding Ring? Are you someone who prefers the cool tones of platinum wedding rings or the warm radiance of 18K yellow gold wedding rings? Metal and style are intimately connected to the aesthetics of your ring. The choice of what metal you opt for in your wedding ring is actually a topic of considerable complexity. 8. 14 or 18 Karat or Carat Wedding Rings? The word, karat, derives from the word "carat." Carat first came to use in Greco-Roman society as a unit of weight related carob seeds, which are surprisingly uniform. We now measure precious gems in carats, while karats reference the percentage of gold in wedding rings. Twenty-four karat gold (24K) is pure gold, or as jewelers call it, “3 nines”—meaning .999% gold pure. But pure gold is about as hard as your fingernails. It wouldn’t hold up well in wedding rings. Alloys are added for three purposes: to make the gold harder, to make it more suitable to jewelry fabrication, and to change the color of the gold. 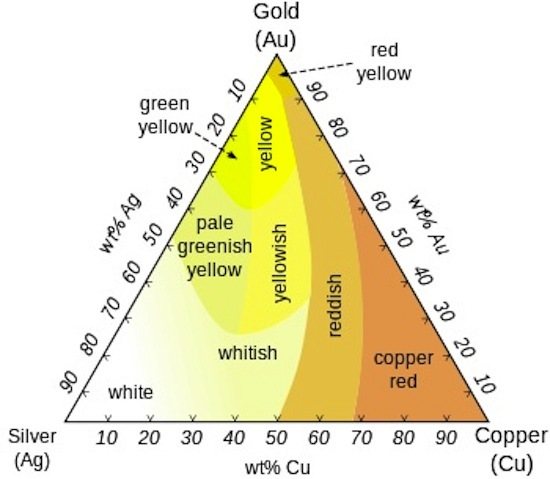 Gold can be yellow, white, rose or even green. We’re going to start with yellow gold and treat the white gold options as part of the white metal discussion to follow and we’ll cover rose gold briefly towards the end. An 18K gold mens wedding ring is 75% pure gold, while a 14K gold mens wedding ring is 58.5% pure gold. Metal alloy makes up the balance. Here’s what you need to know. Whether a 14K or 18K yellow gold mens wedding band is best for you depends upon personal preferences; budget and somewhat of your lifestyle. To understand why we recommend choosing yellow gold for an 18K ring and white gold for a 14K for ring, you’ll have to understand just a bit about metals and alloys. The most important quality of an 18K gold wedding ring is its high gold content. If you compare an 18K gold ring with a 14K gold ring, you’ll see that the 18K has more radiant beauty simply because it is 75% pure gold vs. 58.5% in a 14K ring. Higher karat gold also has more caché. Fine jewelry refers to 18K gold, not 14k. Some jewelry brands only produce in 18K as a signet of their brand value and prestige. Our Felicity Twist Mens Wedding Ring. Shown in 14K (left) and 18K Gold (right). There are two main advantages of 14K gold rings over 18K gold rings. 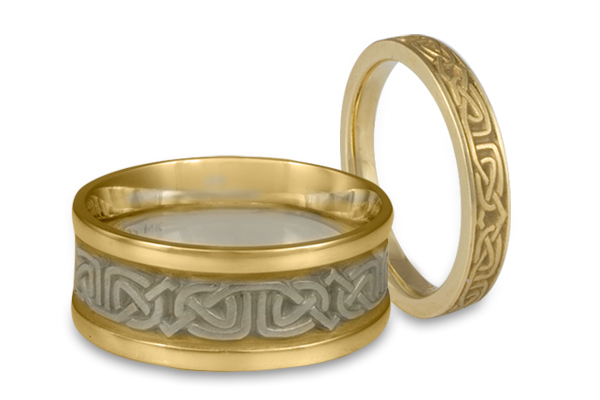 The first is that the price will be about 25% less expensive because there is less gold in the ring. The second is that a 14K gold mens ring is harder and more durable than the 18K gold mens ring. In the case of 14K vs. 18K, unless you do abrasive activity with your hands, we recommend choosing an 18K mens wedding band. If you love the natural color of gold, the radiant warmth of 18K yellow is also an excellent choice because it has a very exquisite color and feeling tone. The additional price is worth it for a lifetime investment. However, if you are looking at mens white gold wedding bands, we recommend purchasing 14K, because with more alloy, the color is whiter. The ring is more durable and less expensive. This leads into next issue, which is consideration of white metal wedding rings. If white metals are not something you’re considering, skip down to point 19 in this article. Our Wide Wind and Waves Mens Wedding Ring. Shown in 14K Gold (left) and 18K (right). These days, most couples prefer the cool contemporary tone of white metal wedding rings. But how white does this white have to be? Currently, whiteness is scaled against a “yellowness index” (YID) created by Gretag Munsel, as determined by a color spectrophotometer. Yellow is expressed by a greater number, which ranges from a pure white to a white that borders with beige. This chart from the Platinum guild shows white metal spectrums on the YID. First, we’ll consider metals that are naturally white and therefore consistent in their whiteness. Platinum’s whiteness is at 9.5 and palladium, which is in the platinum family, is similar in whiteness. If you were to look at a platinum mens wedding ring beside a palladium mens ring, you’d have a very hard time detecting the difference. Stainless steel is similar in look and color to silver, which on this scale would be 7.5. Unlike naturally white metals, the white in mens white gold wedding bands can range from bright white to a color that leans toward beige, depending upon the amount of alloy used. Thus, an 18K white gold mens ring, which is 25% white metal alloy and 75% gold, is going to be yellower than a 14K white gold mens ring which is 58.5% gold and 41.5% alloy. Here’s the deal. Many jewelers have encouraged customers to purchase white gold wedding rings that are 18K because it’s a higher price. However, sometimes, the alloys are not stable, so rings, over time, turn yellow. A common solution is to plate the ring with rhodium, a naturally white metal also in the platinum family. These issues around plating are debated by jewelers in this article posted to my Fair Jewelry Action site. We, personally, are against it. Who wants to take their wedding ring into a jeweler every few years for maintenance, like changing the oil in your car? I consider it a scam that jewelers use just to upsell you an 18K white gold ring and keep you coming back into their store. 14. Is Your 18K White Gold Mens Wedding Band White Enough? While it is true that the white gold mens wedding ring with one jeweler might not be as white as that of another jeweler, the question is, does it really matter? We have sold mens white gold wedding bands in both 14K and 18K online and in our gallery for decades and have never used rhodium plating. Not once have we had a ring returned to us because a customer was not happy with the whiteness of the wedding ring. Nevertheless, as we mentioned above, we recommend 14K white gold over 18K white gold. But, if you want the brand caché of higher carat gold, 18K is fine as well. Palladium and platinum are both naturally white metals and are considered among the rarest metals on earth. The first recorded use of platinum for jewelry was by pre-Colombian indigenous people in South America. The earliest use of platinum in jewelry occurred in the 1500s. Palladium was first utilized in jewelry production in 1930 and has become particularly popular in the very recent fifteen years. Both metals are similar in appearance. The most significant difference is in weigh and cost. Platinum is also considerably heavier than palladium and costs twice as much. Either way, both make excellent, long-lasting wedding rings. For a more detailed comparison, see this article on platinum vs. palladium wedding rings. 16. Alloys and Hardness In White Metal Mens Wedding Rings? We have already considered how important alloys are in the composition of white gold wedding bands. As I mentioned before, alloys also serve to make metals harder, more durable and suitable for jewelry production. The particular alloy combinations used in precious metal is wide ranging and in some cases patented. What’s covered here is just a general overview. Platinum and palladium are 95% pure white metal alloyed with white metal. Palladium is alloyed with ruthenium, while platinum is alloyed with iridium, ruthenium, and cobalt. Copper is the alloy of choice for sterling silver, which is 92.5% pure. Silver and nickel are the alloys of choice for white gold in the US, while in the EU, white gold is alloyed with mainly palladium. Nickel is prohibited in the EU because a small percentage of people are allergic to it. Using palladium as an alloy for white gold can raise the price of wedding rings by 20%, but if a person is known to have allergic reactions to nickel, it is critical. The actual cost of a mens ring is determined by the metal choice; plus design complexity, degree of customization, shop costs, and location of manufacturing. Platinum is the most expensive material, followed by 18K gold. Palladium and 14K gold are comparable in price and lower than 18K. Stainless steel and silver can be as costly in their production as mens wedding rings made out of a more expensive metal. This is particularly true if the mens ring is not merely dye struck in a factory in China, but rather, produced in a small studio, where shop and labor costs remain constant regardless of what the ring is made of. Nevertheless, silver wedding rings and stainless steel wedding rings are generally much less expensive than gold, platinum or palladium because material costs are less. 18. 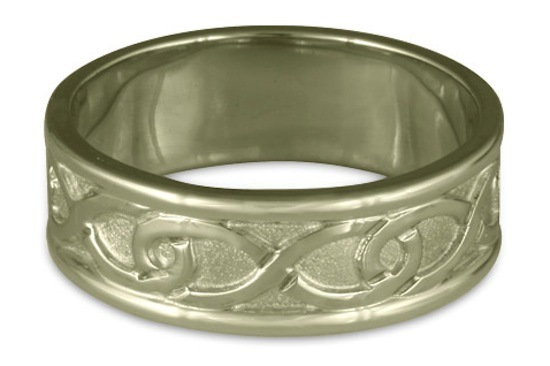 Which Is The Best White Metal Mens Wedding Ring? These days, platinum with its great caché is often the first choice for those who can pay the price. The platinum brand conveys exclusivity, status, and wealth. On the opposite end of the mens ring price spectrum are silver and stainless steel. Silver is a comparatively soft metal, yet some like how silver wears and feels. Stainless steel is a relatively new material for wedding rings and its greatest advantage is its durability and cost. Yet, for some, stainless steel will never even come to mind for their wedding ring. Also, gemstones cannot be set as accents within stainless steel wedding rings. For a natural white metal, palladium is a great choice. It is harder, purer and whiter than white gold, yet sometimes 40% less expensive than platinum. The obvious question is, why are people still choosing mens wedding rings made of 14K white gold instead of palladium, since they are even in the same price range? Perhaps the answer is because palladium is not a well-known, traditional choice for mens wedding rings. Yet there is another answer that is highly subjective and has to do with what can be described as feeling tone. Gold, as was mentioned earlier, has a deep and resonate meaning in our culture. Gold wedding rings are highly traditional. The feeling of gold is that of warmth and essence. Some people will choose gold over palladium simply because it feels right. Rose gold can add a nice touch to any wedding ring, especially when combining with white or yellow gold. Pictured: Our Narrow Two Tone Love Knot Mens Wedding Ring. Just a brief mention of two other metal choices for mens wedding rings that are not as popular as white or yellow gold. Rose gold wedding rings are a great metal choice for mens wedding rings, and is worth considering if you're wanting something slightly different, or out of the norm for metal choices. They have a very warm and lovely tone. 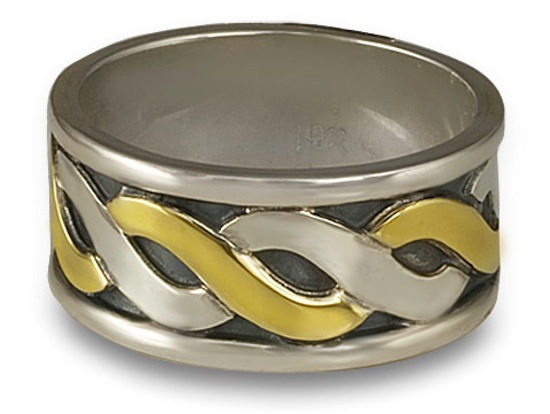 Two tone wedding rings are also a magnificent metal choice for mens rings. They pertain to the more designer or artsy taste. Crafting jewelry by hand is something we are very proud to offer as a company here at Reflective Jewelry. 20. How Is Your Mens Wedding Ring Made? These days, mens wedding rings that are entirely made by machine are standard fare—except for a few remaining artisanal studios, like ourselves. Yet, traditionally, there was a meaningful relationship between the artisan, who had a long-standing relationship to craft, design, and material, and the patron. 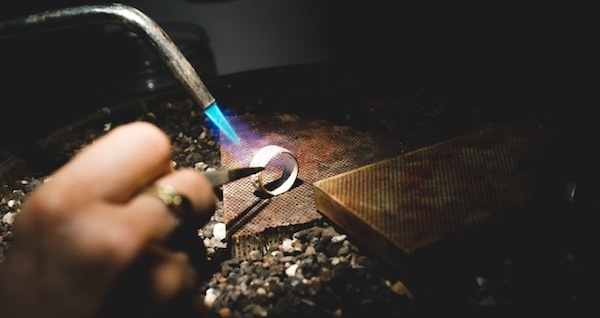 If you still feel that artistic magic and love of handcrafted trades and material choice are important factors in your wedding ring, then it is worth considering how the ring is made. Most of the mens rings made today are generated on CAD/CAM files, and then sent to modeling machines which then replicates for mass production. Another method for creating commercial mens rings is dye striking. Two pieces of steel, one male and one female, brought together by using as much as fifty tons of pressure, to essentially “strike” a piece of metal into the desired form. Both these mass production methods create beautiful but (in our opinion) soulless rings. Michelangelo Stanchi, who created this ring, learned his wax carving craft passed down from his family line in Italy. 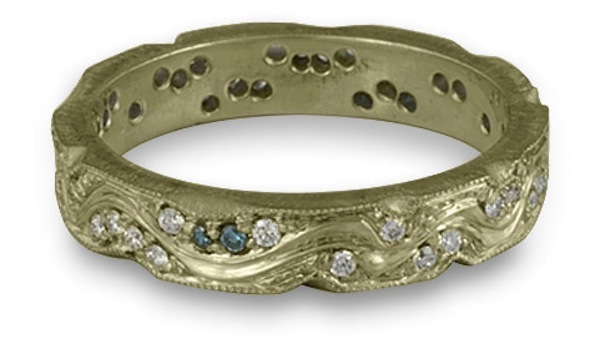 Some classically-trained jewelers can work from a drawing and then carve the design into a wax, which is then cast out, or used as a mold, using the traditional lost wax casting technique. This type of carving requires years and years of experience and skill, training and sincere love of craft and the materials used and manipulated. Our handmade two tone wedding rings can be made using combinations of white, yellow, or rose gold—or even silver. Jewelers in our company pride themselves in being artisans, part of the maker’s movement. Working the materials of sheet and wire with our hands our techniques are rooted deep in the traditional metalsmithing techniques of the Southwest, where methods have been passed down from the Spanish for hundreds of years. The energy of the artisan, the love of material, and the long-standing craft traditions, make a beautiful alchemy in the making of wedding bands for you and your partner. You’ll probably agree with me when I say that no one wants to wear a wedding ring that in its production has destroyed ecosystems and impoverished communities. Yet unfortunately, for most people that is the norm. 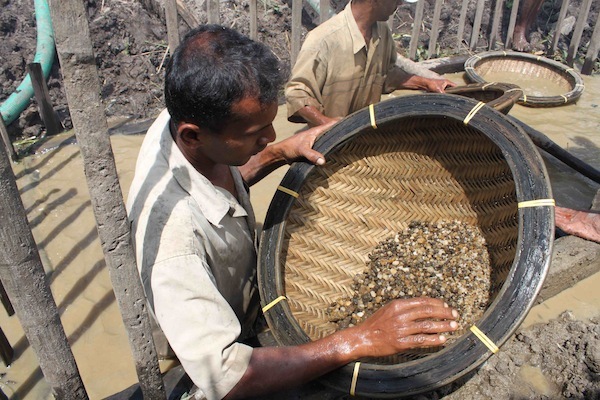 Dirty gold and conflict diamonds are very prevalent in the jewelry supply chain. Essentially, the symbolism of a wedding ring represents the direct opposite of the sourcing of a wedding ring. If you want to bypass this inconceivable disconnection so prevalent in our culture, then consider two questions when looking at mens rings. First, can your jeweler trace production and sourcing of the ring from the mine, through its making, to your finger? Second, and equally important, does your wedding ring actually create benefit and positive change for communities where the metal was sourced or mined? We will take a brief look at the utmost best ethical options for both metal and gemstones. A miner working with Ruby Fair searches for rubies. Upwards of 70% of gemstones are supplied by small-scale miners worldwide. Conflict funded by gemstone mining is not a huge issue, as it is with diamonds. Here’s an article on ethical gemstone disputes. We can source ethical small-scale rubies and sapphires suitable for weddings rings. With diamonds, the available option is generally recycled or Canadian. The best option for palladium and platinum is recycled metal. However, recycled metal has no beneficial impact on the environment or mining practices. Any jeweler can do it. It has become the standard in the jewelry world, but really it just bypasses the issue of unethical mining practices. Plus, it absurd to think that major mining companies will change their practices because of yours or my purchase of a mens wedding ring made with recycled metal. With gold, there is a much better and more ethically effective option: Fairtrade Gold. 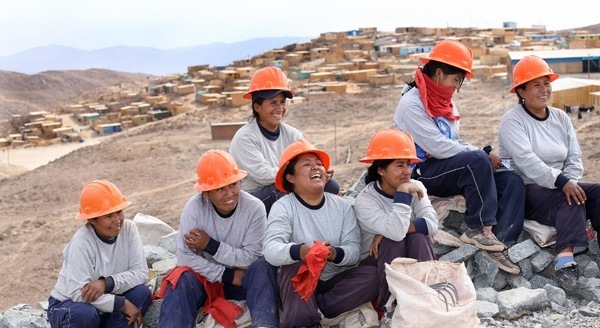 Empowered Fairtrade Gold miners from Peru. Read about our current sourcing here. The Fairtrade Gold certification is an independently-audited set of standards and principles created by Fairtrade International in collaboration with miners and jewelers. Read how it works here. Or delve deeper into the intricacies in this section of our Ethical Jewelry Exposé: Lies, Damn Lies, and Conflict Free Diamonds. The entire program is based upon transparent and traceable supply chains. The result is that artisanal small-scale miners are empowered to improve their livelihoods. Retailers and consumers are given assurances that the miners are fairly compensated for their efforts, and that the environments, including watersheds, around the mines are not contaminated with mercury or cyanide. Just has Fairtrade coffee and chocolates have made a huge difference in the global south, Fairtrade gold can have a revolutionary impact not only within the jewelry world, but also outside of it as well. In purchasing a Fairtrade Gold wedding ring, you’ll be part of the global movement that reduces poverty and environmental contamination while empowering small-scale miners to live their lives free of poverty and exploitation, just like the Peruvian miners shown above, so they can move beyond merely surviving and into flourishing opportunity-filled lives. 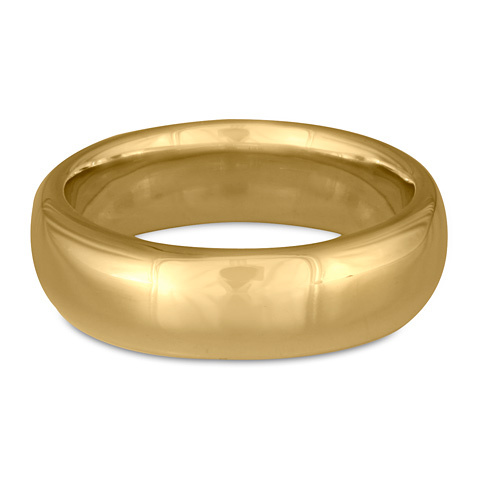 Our Classic Comfort Fit Mens Wedding Band, 7mm, in Fairtrade Gold. The tradition of wearing wedding rings is six thousand years old; back when rings were made from braided reeds of grass, or help was exchanged, to represent the ever-lasting love of the couple. The finger on the left hand isn’t randomly chosen; the left handed ring finger, according to the ancient Egyptians, houses the Vena amoris, the “vein of love” which connects directly to the heart. There are so many different considerations when purchasing wedding rings, but there is no right or wrong decision. Like the ancient Egyptians and all the fulfilled married couples since then, it is all about connection with the heart. Choosing a wedding ring is just an expression of that first step of a heartfelt commitment that will confidently last the rest of your lives. What’s most important is what feels right for the both of you. I love it when seeing both people in a couple showing off their engagement rings.... and its great to see some ring designs that men would feel good wearing!